Van Wyk met EFF President Julius Malema and party spokesperson Mbuyiseni Ndlozi on 30 September 2015. Ndlozi was at the time still studying towards his doctoral degree. 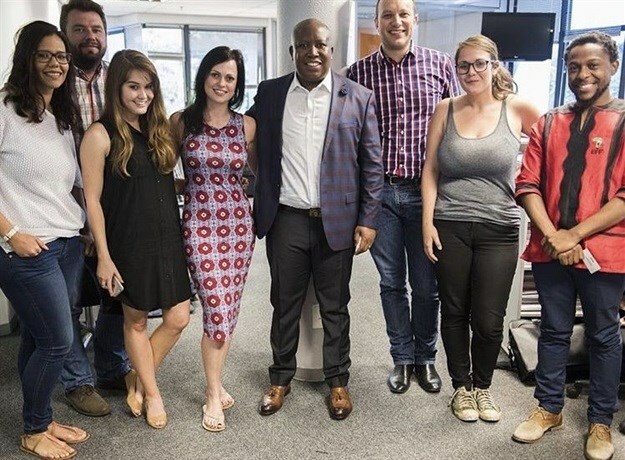 The EFF leaders visited the Netwerk24 office at Mediapark, Aucklandpark, Johannesburg. The thought didn’t cross her then that three years and one month later, Malema would call her 'Satan' because she shone a spotlight on corrupt activities linked to the implosion of VBS Mutual Bank. From left to right is Carryn-Ann Nel, Pieter du Toit, Charlea Sieberhagen, Van Wyk and Malema, Adriaan Basson, Claudi Mailovich and Ndlozi. It’s often said there’s nothing harder than working in hard news. You tend to work beyond the normal 9-to-5 as the news cycle waits for no-one, and this is not the stuff of fluff pieces. Instead, you’re covering the world’s biggest action. Those real-life events that often have far-reaching consequences and you tend to move from one tragedy to the next, with little time to recover in between. Van Wyk knows this life better than anyone, having just been announced as the IAB SA’s first-ever Best Online Journalist of the year for her outstanding investigative reporting for the Daily Maverick. Receiving this award from an industry that places high value on quality and excellence is a huge honour. It endorses my work in an era where fake news is a thing and everyone with a smart phone can push content into the public space. It’s an intriguing life, but one many can only guess at. Van Wyk with the pile of wood. 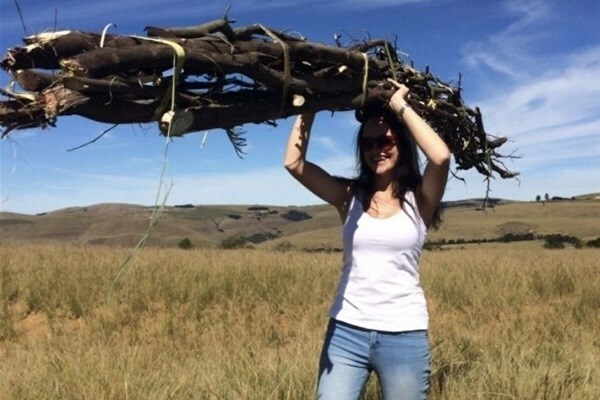 Ngcobo with the same pile of wood. Image caption: On 29 April 2014, weeks before South Africa’s national elections, Van Wyk met Florence Ngcobo in the village of Nkandla, KwaZulu-Natal. 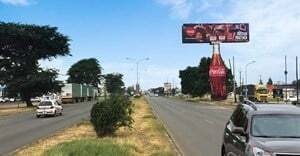 Van Wyk was on a tour of the province along with photographer Bongiwe Gumede in order to write about the state of KwaZulu-Natal as it was a historic and contemporary political hotbed. 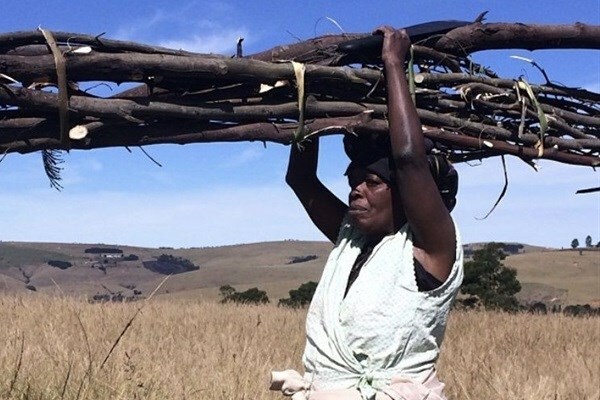 Florence was nearing 70 and had to carry this heavy pile of wood 3km far to her hut every day from where she personally chopped the wood with her panga. Van Wyk tried to pull of the same feat, and failed miserably. Let’s start with the ‘hard news’ – share a few of the stand-out moments of your career so far. Being recruited as the inaugural member of Daily Maverick’s investigative team Scorpio, to work on the #GuptaLeaks, was very special. My work on Sars, spanning the past five years, further shone a spotlight on the ruinous effect former Commissioner Tom Moyane had on what was once the crown jewel in the state machinery and ensured that, ultimately, Moyane got fired and a Commission of Inquiry into Sars was initiated. It is a hard job, being a journalist, and mostly we don’t mind or complain. The Economic Freedom Front’s recent violent and vitriolic online attacks on me and the Daily Maverick, based on our revelations of just how deeply their leadership was involved in the robbery and implosion of VBS Mutual Bank were, however, hard to stomach. Understandably so. Let’s rewind a bit: How and why did you get started in the profession? My big dream as a student was to work for the travel magazine, Go!/Weg!. But during a holiday working stint there, the magazine's editor told me that, if I wanted to be excellent, I had to gain experience from a newspaper first. So off I went to work at Beeld in Johannesburg. When my first front-page article got published (in print!) within my first month there, I was hooked on this thing called “news” forever. Your career has skyrocketed since then. What do you most enjoy about working for the Daily Maverick? Investigative journalism takes time and is expensive – a fact that never deterred our editor Branko Brkic and CEO Styli Charalambous from giving me the space and support I needed. Daily Maverick has since become the collective noun for a number of the best journalists in South Africa, who fearlessly go about their work in order to help our people make sense of this world they live in. You alluded to this earlier, but there’s no denying that the role of general media worker and particularly online journalist has changed drastically with the incorporation of technology into the job. Talk us through your everyday process in covering a story, from brief to reading it online. No two days in my life are ever the same. Because I work on projects in the form of series of articles on one topic rather than single articles focused on a topic, I first get to know the lay of the land. 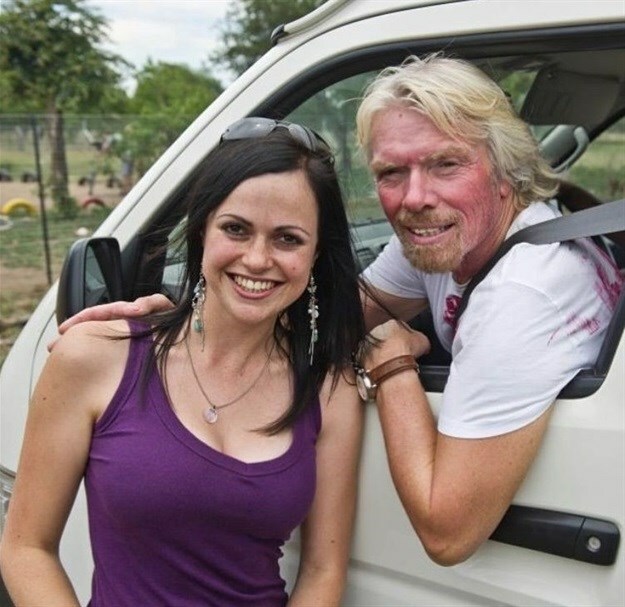 In 2011, Van Wyk met Virgin boss Richard Branson and Hollywood actor Christian Slater in rural Mpumalanga at a creche they funded and supported at the time. She says: "It’s no filter-gone-wrong that caused Branson’s face to be this red - he was painting with the little ones and somehow also became the canvas." I speak to a wide collection of sources, read up on the topic as much as is available and then measure the existing facts or tip-offs I have against what should have happened. It all sounds fairly simple, right? It is not. Between a tip-off about wrongdoing and actually proving said wrongdoing often lies months of slog and painstaking puzzle-building. How do you then switch off when you need to de-stress and stay focused when the going gets tough? I run, I box and I love my dogs! A girl after my own heart! Let’s end with some advice to the aspiring online journos out there, on how to make a successful start in this career. Start at the beginning. You don’t just walk into a job named “investigative journalist”. You need a lot of skills to grow into this specialised field. First do your time in several beats that include reporting on entertainment, crime, courts and politics. 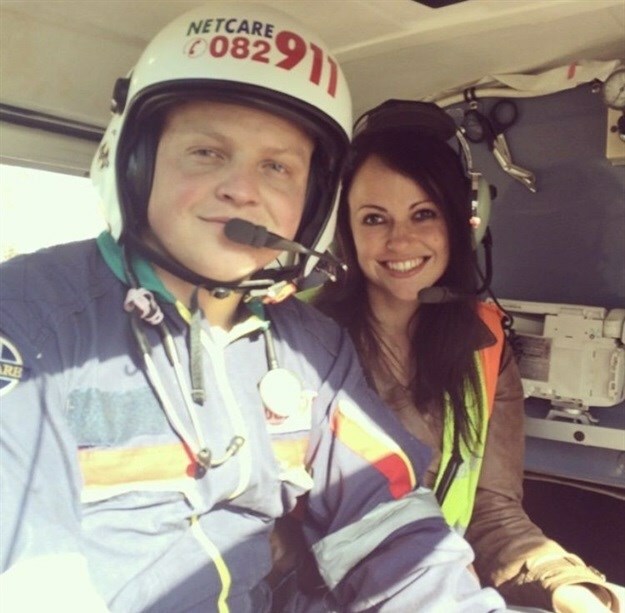 Here, Van Wyk is in a Netcare 911 medical helicopter with 'rockstar advanced life support medic', FG Klopper on 18 June 2014. The crew was dispatched to the Westrand of Johannesburg where a patient fell 3m from scaffolding. He broke his pelvis in four places, fractured a few ribs and injured his lungs. Van Wyk hitched a ride to record the amazing work these people do. Van Wyk’s certainly proof of that pudding. 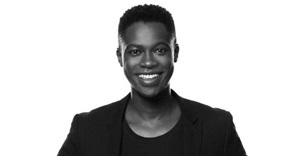 Follow ‏Van Wyk, as well as the Daily Maverick on Twitter for the latest updates. Also, click through to our IAB Bookmarks Awards and Summit special section on site for continued coverage of this year’s winning work.